Zuke's Latest Treats: Genuine Beef Jerky Trio Giveaway! The latest in Zuke's amazing line of super high quality treats: Genuine Jerky Treats come in three different beef recipes (Original, Barbecue and Teriyaki) and you can win a three pack for your best friend right here. See directions at the end of this post to enter! You know we're a fan of Zuke's and have brought you a number of Zuke's treat giveaways in the past. 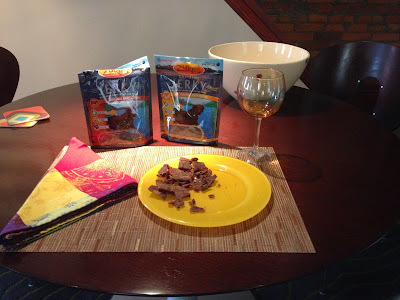 Thanks to Zuke's generosity, we recently received three packages of Zuke's Genuine Jerky Beef Treats, one in each delicious flavor, for our review. Zuke's is also graciously providing a three pack of these treats for our winner. We have received no other compensation for this post and the opinions are, of course, our own. Here's my trio of treats—notice who's sniffin' things out already. Full disclosure: I've eaten almost a full bag, so I know how delicious they are! You also know how Parental Unit loves to examine ingredients for both her food and mine with microscopic precision...Well, Zuke's got her attention with "100% Grass-fed New Zealand Beef" as the first ingredient, with only a few natural flavorings to add to the "crazy good" taste of pure dried beef. Although Parental Unit doesn't eat much meat, when she does, it's exclusively free-range and grass-fed—she's long known the superior quality, nutritional value and taste of pasture raised meat. And I, of course, deserve no less. 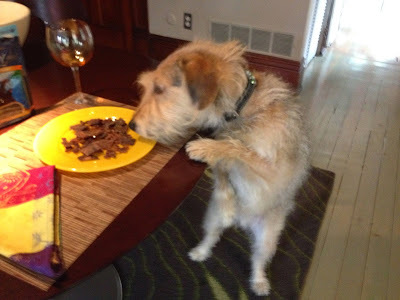 Parental Unit thinks these treats are so special she even set the table for me...The plate is holding a combination of Zuke's Genuine Jerky Treat recipes. She also thinks she's going to get away with giving me just one (hehehe). 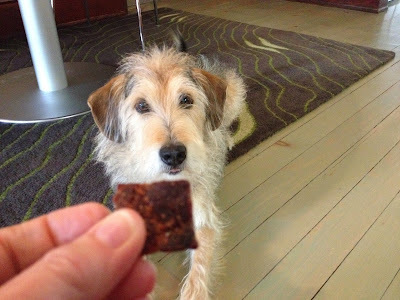 By the way, don't expect long jerky strips, these treats are presented in nicely-sized pieces, perfect for training...or just because. Hmmm...here's what the plate looks like. Oops! Parental Unit waited for a good photo a bit too long...We're both happy I didn't drag the plate onto the floor! But wait, there's more... Please take a few minutes to read Zuke's founding story and company philosophies—they're celebrating their 20th anniversary this year! Zuke's also donates a portion of every sale to the Dog and Cat Cancer Fund—#FueltheLove, #FueltheCure! 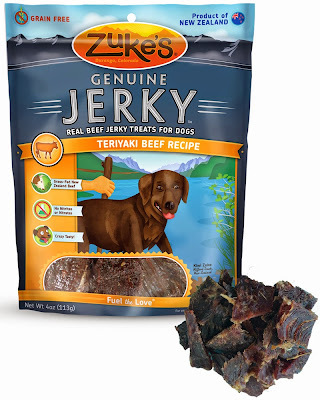 One lucky Bocci's Beefs reader will win a trio of Zuke's Genuine Jerky Beef treats! Please follow the Rafflecopter directions. I'd love to win for my dog! Schooner & Skipper would love to win Zuke's Yummy treats! 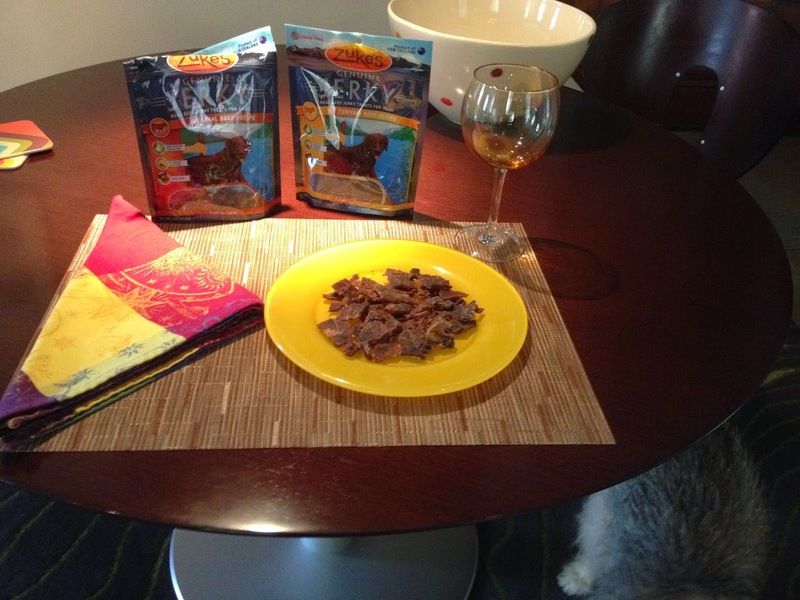 I'd love to win these high-quality treats for my dogs. My little doggies would love to win Zuke's treats. My doggy would love to win some Zuke's treats! They look wonderful!! I would love to win and my beagle would love me to win even more! 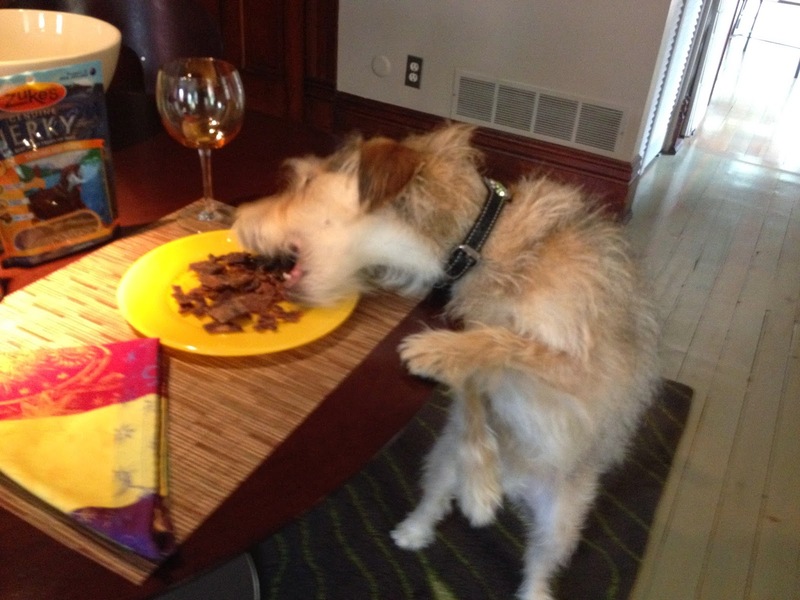 Would love to win for my little Starbuck, who enjoys all things jerky! I'd love to win! My dog will love these! Me and my pup would love to win! 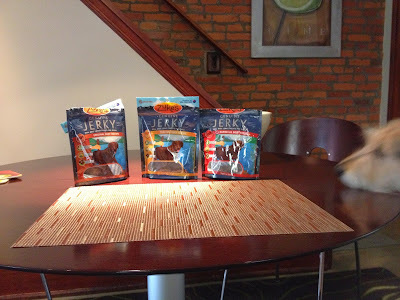 My dog, Tonya, loves these and would like to win some! because my baby girl lovessssss jerky! Id love to win for my new puppy were getting on friday! The kids would love to win these treats. They really like them! I would love to win- my dogs LOVE Zuke's treats, but haven't tried this variety yet. i would love to win some Zuke's for my 3 gals, they can always use some treats.